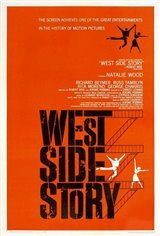 This brilliant film sets the ageless story of Romeo and Juliet against a backdrop of gang warfare in 1950s New York. A love affair is fated for tragedy amidst the vicious rivalry of two street gangs, the Jets and the Sharks. When Jets member Tony (Richard Beymer) falls for Maria (Natalie Wood), the sister of the Sharks leader, it's more than these two warring gangs can handle. And as mounting tensions rise, a battle to the death ensues, and innocent blood is shed in a heartbreaking finale.